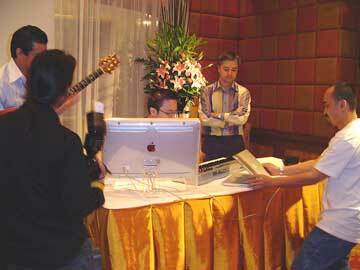 Last Friday, 12 March, at the Erawan Hotel in Bangkok, Apple demonstrated new software to the Press, as well as officially launching OSX 10.3 (Panther) here. Presentations were made by Tony Li of Apple's Singapore office. He started with the new Panther attributes. The official price of the operating system is now 6800 baht (although copies are on the shelves for considerably less). When I commented on the difference, Apple representatives pointed out fluctuations in currency and the attentions of Customs as some reasons for the higher level. 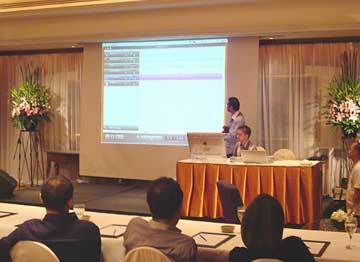 Mr Li went on to introduce Final Cut Express 2, an application for editing and making movies. It is the latest consumer version of Final Cut, with a recommended price of 14,700. Final Cut Pro is above 40,000 baht, but not many users need this type of strength. Higher up the scale is Shake, which has been used in the making of the last seven winners of the special effects Oscar. Not many of us will be making The Lord of the Rings, but this is what the Macintosh could do if required. Tony Li then went on to introduce the suite called iLife '04: iPhoto 4, iTunes, iMovie and iDVD, plus the newcomer, GarageBand. I was critical of Apple when this was released. Users at the lower end of the scale are limited in what their machines can use: for some it would mean a whole box just for an iPhoto upgrade (iTunes is a free download), although iLife does come with new Mac purchases. The price for the suite is 3,500. A part of this can be explained by Customs and taxes but not all. Nevertheless, for what there is, this is still a bargain. Tony demonstrated the four familiar applications and there were few surprises. These programs are wonderfully integrated: each can draw on the other's resources. It is with GarageBand, however, that this suite takes off. Using a similar drag and click approach to iMovie, users create music by dragging one or more of the (over 1,000) pre-recorded loops onto the interface. These are edited and expanded, and more loops can be added, so that an unmusical user can create tunes. The music created can be exported to iTines and also to the iPod. After Tony Li had shown us how to create music using the loops, two professional musicians demonstrated how they used GarageBand to modify the music they created: Johnny Yim from Hong Kong on keyboards and Tanapat Mathayomchand, from KPN Music Academy, on guitar. I had been teetering on the edge of making a decision about a new Mac but iLife, and particularly GarageBand, has tipped the scales. While not at the level of software such as Cakewalk, the ease of use that GarageBand and the other applications offer, make iLife a must-have.